There were a lot of pictures taken this week. My problem... I have NaBloPoMo on the brain and I have entirely different possible posts to go with them. Plus... none were particularly "best shots". So in a moment of "whatever will I post!?!?!" 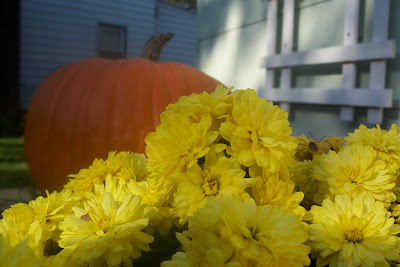 I ran outside to our annual fall display of mums and pumpkins. I usually take a few pictures each year of the set up... and I hadn't done it yet. So... here are 2 interesting shots that resulted. 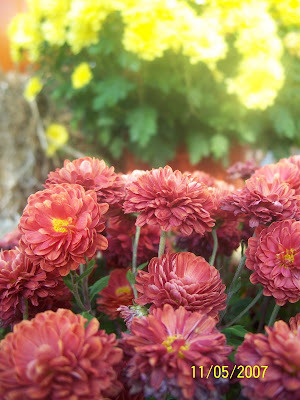 For more Best Shot Monday photos head on over to Picture This! Wordless Wednesday - What happens when you run too fast and fall on your face?